I would like to know if you have any way of knowing if there are model kits available of either US Vermont or other ships in her class. I build ships from WW2 through Vietnam era, I also do planes. I have a sister in law that told me her grandfather served aboard the Vermont in 1908- 1910, and was wondering if there are any still around, so far all I can find are photos . If you have any information please contact me through the webmaster. I have a letter retrieved from a junk pile from an empty house many years ago. The letter was typed on U.S.S. Vermont stationery, dated November 24, 1917 and signed "Your brother, Louie" (no last name). Is there any way to find a list of crew members who served our country at that time? This letter was written to his family in Jamestown, New York. One comment in the letter refers to women being allowed to vote in New York and he personally didn't think they should have that right. I would love to see this letter returned to his descendents if at all possible. I am also from Jamestown, NY (now living in South Carolina) and only assuming since he mentions brothers Sam and Ben and his own name being Louie that he might be of Italian descent. Thank you so much for any help in this matter. My grandfather, Paul C. Watson served on the USS Vermont from 1918 to 1920, so was on board when your “Louie” was there! In civilian life, he was the Berwyn, Illinois, town paper owner “The Berwyn Post” (my great grandfather owned it before that). 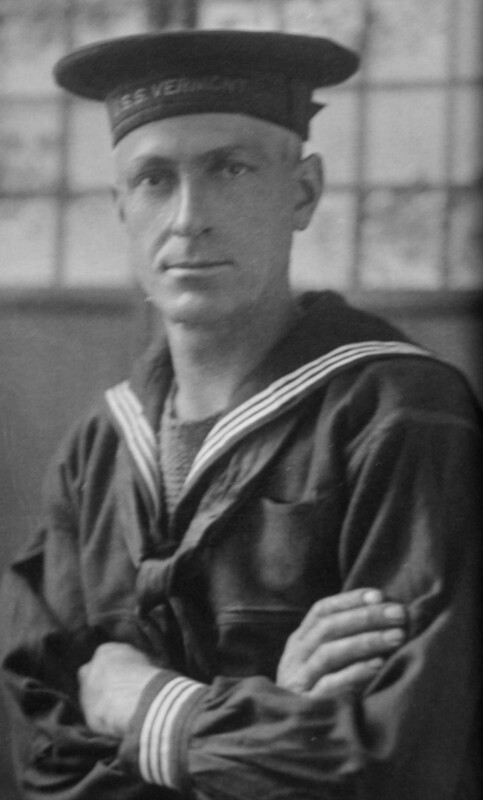 In the Navy, he was the printer on board the Vermont, so all the stationary and printed material on the ship came from his printing shop on board. Going through some articles of my late father, I found a New Testament dated APR 1915, and in it was a signature and "USS Vermont" BB-20, that would make my Dad at the age of 19, he was a radioman/electrician. Is there any way to find a crew list? He was from Cumberland, Maryland. The other day while going through an old family bible dated 1884 I found between the pages a perfectly preserved photo (see below) of one of the crew members of the U.S.S. Vermont. I was wondering if any of the members of your board might be able to identify him. Any information can help will be greatly appreciated. I am a retired Navy man and would like to make sure that this photo gets back to where it belongs. I haven't a clue as to who owned the Bible before I bought it at an auction. The only clue was a couple of newspaper articles from Iowa and Illinois. Can you help? The above posting dated May 31, 2009 with a picture of the sailor from the USS Vermont looks to be my great-grandfather, William Stuart Radebaugh, who sailed on the ship in 1918. Below is a picture for comparison. If you still have the photo, I would love to connect and retrieve it from you for my family. I've got a letter from my Step Grandfather who appears to be a member of the crew aboard the USS Vermont. It dates Feb 1913 in Vera Cruz Mexico. I was wondering how to find more info on him, dates of service. He so far has sent letters from USS Minnesota & USS Constellation as well as the Vermont. We hardly new he was in the Navy, he passed in 1969. Thanks for any help. I have a wonderful picture of the USS Vermont that my grandfather, Frederick Raymond Bruce, brought home after serving on that ship. My mother believed he was a signalman. I will scan and email a picture to anyone who wants to see this picture. My sister, Beverly Richards, posted a message here earlier. Since that message, Frederick's daughter, our mother, passed away on Feb 6, 2009. See obituary (Beatrice Nelson). Thank you for the great photos and ship information for BB20 USS Vermont. I am the great grand niece of a crew member, Crangle, Harry (census 1910). This is a great find in expanding his genealogical file and story! 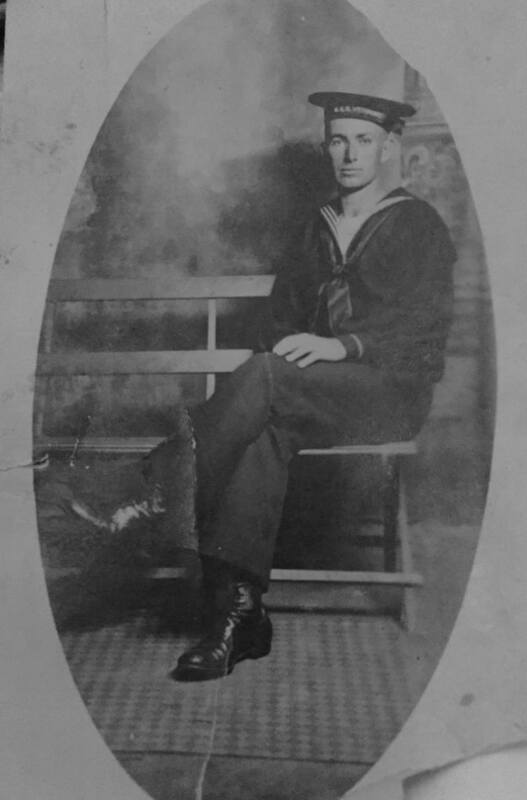 My grandfather's name was Frederick Raymond Bruce, he served on the USS Vermont probably in the early 1900 - 1940s. My sister and I are trying to find some information to present my mother (his daughter) with a gift honoring her father . . . any information you could give me would help. He lived at one time in Wooster, Ohio. My grandfather served on this ship. I am trying to find out more about him, to little avail, since he died shortly before my mother was born. But I know he served on the USS Vermont (I have a photo of him in his USS Vermont Uniform, with the hat clearly stating USS Vermont. Is there a way to find out whether he is listed as a crew member? And to whom else could I write to perhaps find out more about him. His name is H. N. Willie (he apparently went by Newt or Nate Willie).